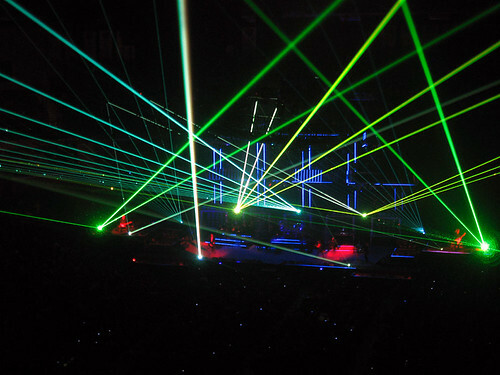 Kevin surprised me with Trans-Siberian Orchestra tickets for my birthday. We went to see them last night. Because we’re cheap, he bought four, (yes, the boys went with us), cheap tickets. 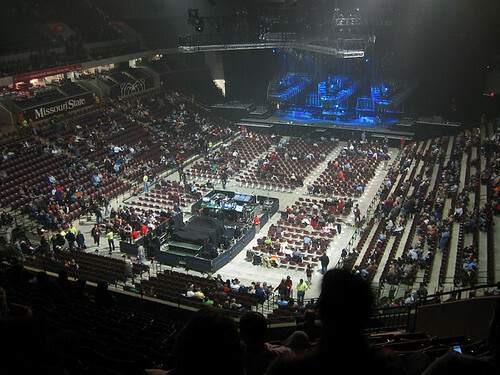 The concert was at JQH Arena and we ended up sitting in section OO, row 12. Just three rows DOWN from the very top. I.E. – nose bleed section. I’m not complaining, mind you. I would rather sit in the nose bleed section than spend another $80.00 for a better seat. But it was SO far up that I actually experienced a mild case of vertigo. I had to close my eyes a few times to reorient myself. Our seats were on a 45 degree angle and it was really spooky to look down because it was practically a sheer drop down to the landing below. I’ve never sat in seats in a stadium quite like that before. I worried that Dude would be completely freaked out because he HATES heights, but he actually did better than I did. I downplayed my reaction to keep the boys from being spooked, but I’m telling you guys, I WAS A LITTLE FREAKED OUT. Before the show began, local radio show disc jockeys came out to present a check to the Victory Mission, which is a local charity for the poor. Apparently, one dollar from each ticket went toward their charity, which I thought was uber cool, and they ended up presenting them with a check for about $4,800. A man came out to begin the “story.” The first half of the show consisted of this story with breaks for them to play their awesome music. The light show was pretty spectacular, too. Because we were sitting so high up, we were really in the ideal spots for the light shows because they were both below and above us. The lights were so intense at times that I again had to shut my eyes to re-orient myself. *Side note: If you’re prone to seizures, I would NOT go to these shows. Seriously. I video taped segments of a few of the songs. This gives you an idea of what the show was like. We thought the show was finished when the story finished – not so. In fact, the show took a rather bizarre turn after the story – they started playing some pretty hard stuff complete with dragon eyes and jaws. It was weird because the first half of the show was about the beauty of Christmas and the second half was like we had descended into hell. I don’t know if the group was trying to show us that they could play more than just the Christmas classics we’ve come to know and love so much, or what. But it was sort of uncomfortable, if you want the truth. In fact, some people actually left. Again. This type of music was pretty awesome as well. Different. But awesome, nonetheless. It was just a weird switch to what we had been listening to. And just when we thought the show was going to wrap up – it didn’t. In fact, we all sighed with relief when it was FINALLY over. The show lasted 2 1/2 hours. Which was about an hour too long, in my opinion. They should have just ended it after the Christmas story was over – but they continued to play for another hour and a half. Then, toward the end of the show, it was like they had suddenly remembered why we had all come to see them and played a few more of their Christmas classics for us. And each song went on FOR-EVAH. And though the lights were freaking awesome, after a while? They too became a little annoying. The whole concert was too much of a good thing, I think. I know they wanted everyone to feel like they got their money’s worth, and I do feel that way, honestly, but wow. It just went on forever. Overall. It was a very good concert. There is NO disputing how talented this group of musicians are. And the female singer was so good I actually got goosebumps. But it just lasted too long for me and I found myself wishing it would just get over with at the two hour mark. It’s worth the money and the experience, just prepare to sit for a while. Read parts one and two here. We can see the developing and increasing influence of the doctrine of the Trinity in the increasing complexity of the creeds of Christendom, and the clarity with which they promote the Trinity. A creed is a formal and fundamental statement that clarifies a position, and determines who is “in” and who is “out” of the community defined by the creed. It is a type of statement of beliefs. The creeds are important because their content reveals what issues were being debated at the time the creed was written. For example, if a creed mentions baptism, that was important to the group. If it does not, then likely baptism was a non-issue, either because everyone agreed about it without debate, or because it was not important to the group. One of the earliest creeds in Christendom is the well-known Apostles’ Creed. Its date is not known, but we assume from its simple structure and content that it pre-dated the theological debates that raged in the fourth century. The later creeds are much more complex and specifically address the issues of their time. The Apostles’ Creed does not mention the Trinity or any fundamental part of the doctrine of the Trinity, such as Jesus or the Holy Spirit being God. Christians who confess the Apostles’ Creed believe that Jesus is the Son of God and the Lord, who died and whom God raised from the dead, much like the teachings we find in the book of Acts. It seems conclusive that the authors of the Apostles’ Creed did not consider belief in the Trinity necessary for salvation. The Nicene Creed was developed in the fourth century, likely in 381 by the Council of Constantinople, and by that time much of the Trinitarian doctrine was more clearly developed. It states that the Son was “eternally begotten” and one Being with the Father. It also mentions that the Father, Son, and Holy Spirit are to be worshipped and glorified. Despite the clear Trinitarian doctrine of the Nicene Creed, it does not state that a person must believe in the Trinity to be saved. This makes sense in light of the time period in which it was written. At that time many people in the church believed in the Trinity, but many did not. Although many Christians have heard of Emperor Constantine, who presided over the Council of Nicaea in 325 A.D. and was a Trinitarian, most people are not aware that his son Constantius, who was the Roman emperor after him (337 to 361), was not a Trinitarian, and actually was known to persecute Trinitarian bishops. The point is that the doctrine of the Trinity was not settled in the Church yet, so it makes sense that a creed published in the late 300s would include the doctrine of the Trinity but not demand that one had to believe it to be saved. By the time the Athanasian Creed was written, likely in the late fifth or early sixth century, more than a hundred years after the Nicene Creed, the situation in Christendom had changed. Trinitarians had become firmly in control of the Church, and non-Trinitarians were routinely persecuted, which is why, looking backward through history, there seemed to be so few of them during the Middle Ages. In contrast to the earlier creeds, the Athanasian Creed plainly states that a person had to be a Trinitarian to be saved. It was written in Latin, so English translations of it differ slightly, but it clearly reflects the conflict going on in the Church during the fourth and fifth centuries about the formulation of, and belief in, the Trinity. We know that because the one subject it covers in great detail is the Trinity, and how its members relate to each other. The Athanasian Creed clearly states that a person who does not believe in the Trinity, or the incarnation of Jesus, or that Jesus is both God and man, is not saved, and this man-made document expressed what became the uncompromising teaching of the Orthodox Church. The Athanasian Creed, and pronouncements similar to it, proliferated through the Middle Ages and were maintained by the Roman Catholic Church, and then by the Protestant Church. Although there was a great resurgence of non-Trinitarian believers at the time of the Reformation, they were persecuted and even put to death by both Roman Catholics and Protestants. Many of their writings were burned, but thankfully a few survived and are available today, giving us a window into non-Trinitarian thought during the Reformation. The constant persecution of non-Trinitarians resulted in their becoming a miniscule minority through the Middle Ages and Reformation, and in the modern church, something that most churchgoers greatly misinterpret. Most people believe there are so few non-Trinitarian believers because their doctrinal position is weak, but that is drawing the wrong conclusion. The truth is that most who openly shared their faith were killed or persecuted, or were told the Trinity was a mystery they could not understand, and so the vast majority of them learned to be quiet about what they believed. The persecution of non-Trinitarians continues today, and the vast majority of them keep their beliefs to themselves so they will not be ejected from Christian meetings, called “unsaved” (or worse), and rejected by other Christians they have befriended. Like the Medieval Church doctrine, the modern Orthodox Church doctrine is that a person must believe in the Trinity to be saved, but on a practical level there is some serious double-mindedness going on in the Church. This is true, first when it comes to evangelism and winning new converts, and second, in assuring that long-time Christians believe in the Trinity and are actually saved. This prayer clearly shows the double-mindedness of Trinitarians because thousands of them use it to get people saved in their churches, while at the same time their doctrine says it will not get someone saved because it does not teach the Trinity. We non-Trinitarians say that based on the teaching of the New Testament, anyone who prayed and believed the above prayer is saved. We say that this practice of the Trinitarians is correct, and it is their doctrine that is in error. Many of the supposed Trinitarians we have encountered do not even believe that Jesus is God, much less that he is one of three Persons in the Trinity, all of whom are co-equal and co-eternal and who together make up the One God of Christian orthodoxy. If orthodox Trinitarian doctrine is correct, imagine the sad plight of these churchgoers on the Day of Judgment. They would stand before the Judgment Seat, expecting to live forever with Jesus because they believe God raised him from the dead and have confessed him as Lord. But instead of being granted everlasting life, the Righteous Judge condemns them to everlasting death, saying they were not really saved because they did not believe in the Trinity. We assert that if the pastors of local churches really believed that a person had to believe in the Trinity to have everlasting life, they would teach it in great detail; regularly have sermons, classes and seminars on it; make sure that all the elders and deacons were well versed about it; and sit with new converts and any new members of their church to confirm that the person was actually saved. The actions of Trinitarian churches around the globe are speaking louder than their manual of doctrine. It seems clear that, in reality, leaders in the modern church do not really think a person has to believe in the Trinity to be saved. We of Spirit & Truth Fellowship International have encountered a number of people in the Church today, including pastors, who believe that the Trinity is true but admit that it is not clearly presented in the Bible, and thus say that one need not believe it to be saved. These Trinitarian Christians have seen that there is no command to believe in the Trinity, and admit non-Trinitarian believers into their churches and fellowships as brothers and sisters in Christ. The modern Church is waking up to the spiritual power Christians have, and many in different denominations are manifesting the power of God by speaking in tongues, prophecy, words [messages] of knowledge and wisdom, and healing. More and more Christians are seeing that the verse, “I would like every one of you to speak in tongues…” (1 Cor. 14:5), is for all Christians. Although speaking in tongues used to be considered something done only by Pentecostals and Charismatics, now people from very diverse denominations and groups are speaking in tongues, even in the Roman Catholic Church (these are referred to as “Charismatic Catholics”). It is widely admitted that the power to speak in tongues comes from God to those who are saved. Speaking in tongues, then, should be one of the great proofs of who is, and who is not saved, and if non-Trinitarians are not saved, they should not be able to speak in tongues. But many non-Trinitarian groups have members who do speak in tongues. In fact, Trinitarian and non-Trinitarian groups are similar when it comes to speaking in tongues, because some do and some do not. However, if speaking in tongues is an evidence of the presence of the spirit, and thus salvation, which we assert that it is, the fact that people who have accepted Jesus as their Lord, but who are non-Trinitarians speak in tongues is very solid evidence they are saved. Most Christians assert that the Bible teaches the way of salvation. However, if orthodox Trinitarian doctrine is correct, the Bible does not clearly teach how to be saved because it never clearly teaches the Trinity. Could it be that we have to teach a “more complete” message to get people saved than did Jesus, Peter, or Paul? Could it really be the case that a person must believe in the Trinity to be saved, even though there is not one clear presentation of it in the entire New Testament? Certainly not. We assert that the message of Peter, Paul, and others was enough to get their audiences saved and there is no evidence that God, after the book of Acts, somehow changed the rules so that now a person must believe in the Trinity to be saved. The book of Acts makes it clear that when the early Christians presented Jesus Christ to the unsaved, they taught that he was a “man approved of God” who was crucified but whom God raised from the dead and who now is our Lord. 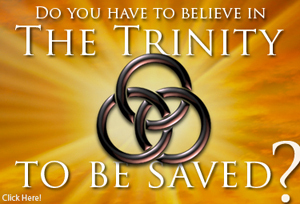 This simple message has been getting people saved for some 2000 years now, and there is no evidence in Scripture or in the practices of churches around the world that one has to believe in the Trinity to be saved. We reject the decision made by men in the Church, somewhere around 500 A.D., that a person must believe in the Trinity to be saved, even though that decision and belief has been supported by Church tradition for centuries now. It is the Word of God, not tradition, that lives and abides forever. Like the great reformers of the Protestant Reformation, who demanded to be convinced from Scripture that a doctrine is true, we demand that Trinitarians show us from Scripture that a person needs to believe in the Trinity to be saved. If they cannot do so, we respectfully submit that they retract this doctrine. Christians will never be able to achieve what our God wishes, that “…we all reach unity in the faith…” (Eph. 4:13), until Trinitarians stop demanding that to be considered Christian a person must believe something that cannot be proven from the Bible. It would be a wonderful thing if Trinitarians would draw their doctrine as well as their practice from the Word of God and welcome non-Trinitarian Christians as part of the family of God. In the above study we have shown from Scripture that a person does not have to believe in the Trinity to be saved. However, there is another point we feel compelled to make. If the Old Testament does not teach the Trinity, if Jesus never taught it, if no one in the book of Acts ever taught it, and if the Epistles do not clearly set it forth, can it really be that the Trinity is right doctrine? Can it be that the very foundation of the Christian faith is a doctrine that is never once set forth clearly in Scripture, but is gathered from isolated texts? God very clearly sets forth the foundational tenets of the Christian faith, including salvation, redemption, righteousness, the character of God (that He is love, light, merciful, etc. ), the fallen nature of man and the need for a Savior, and the work of the Messiah. Which makes more sense, that God is clear about the foundational tenets of the Christian faith except the most important one, the Trinity, which must be gathered from isolated texts, or that the Trinity is actually a man-made doctrine, built from verses that can each be explained in a non-Trinitarian way? To us, the answer to that question is clear. Going strictly by the evidence in Scripture, the correct biblical doctrine is the one that can be clearly seen in the Old Testament and was confirmed again and again in the New Testament. There is one God. He is spirit, so His invisible power and nature are known as the holy spirit (or the Holy Spirit). God had a Son, the Messiah, who we know as the Lord Jesus Christ, who was of the lineage of Abraham and David, born of a virgin, lived a sinless life, died for our sins, was raised from the dead, and ascended to the right hand of God. All of this was taught in the Old Testament and confirmed many times in the New Testament without once being corrected to include the idea of a Triune God. There is no reason not to believe that simple message is the correct biblical doctrine.